What are Some of the Benefits & Drawbacks of Fly Fishing with Crustaceans in Colorado? There are more than 1,100 species of freshwater crustaceans in North America, but only a few are important to tailwater anglers scuds, sow bugs, and Mysis shrimp.Aquatic crustaceans are commonly identified by their two pairs of antennae, jointed legs, and highly visible segments along the abdomen. Unlike aquatic insects (midges, caddisflies, mayflies, and stoneflies) aquatic crustaceans do not go through an adult phase. As they grow and molt they all look the same, with the exception of their size, until they reach maturity. Because they remain in an aquatic state throughout their entire life cycle, there are no hatches associated with aquatic crustaceans. Freshwater shrimplike crustaceans, commonly called scuds, are a significant food source in tailwaters and spring creeks. Scuds prefer stable shallow-water environments with steady flows and temperatures, alkaline water, slow to moderate currents, and a lot of aquatic vegetation. There are approximately 90 species of scuds in North America, but the most important group in tailwaters is from the family Gammaridae. One of the most important genera is Gammarus lacustris, the freshwater olive scud. Scuds have a flattened, segmented body, fourteen pairs of legs, antennae, and a tail. They are powerful swimmers, darting around the bottom of the stream. They use their legs and tail to travel along the substrate, twisting and turning as they swim through dense aquatic vegetation. They curl up into a ball for protection when danger arises. Some of the best scud fishing occurs during higher flows, or periods of extreme variation. For instance, in the South Platte’s Cheesman Canyon, the rising water during the initial phases of spring runoff flushes many of the larger food organisms—scuds, aquatic worms, crane flies, and stoneflies—loose. When fish key on scuds during that time, it can be some of the best nymph fishing of the year. Tailwater anglers should carry a variety of colors in their scud collections. The most common colors are gray-olive, tan, and orange. When I take seine samples, 99 percent of the scuds are a gray-olive, with the occasional tan scud. I have never collected an orange scud in a seine sample. Stomach pumps reveal a different scenario frequently you get a mixed bag of orange and olive scuds. It’s not clear whether the trout ate the dead scud, which turns orange, or if the scud turned orange in the trout’s belly. Olive scud patterns—especially in larger sizes—imitate larger food organisms such as caddis larvae and crane fly larvae, and are effective in larger sizes (8–10) during the spring, when the flows rise dramatically and many of the larger food organisms become available to the trout in huge numbers. On certain tailwaters, imitations of tan scuds, Crangonyx gracilus, are effective. 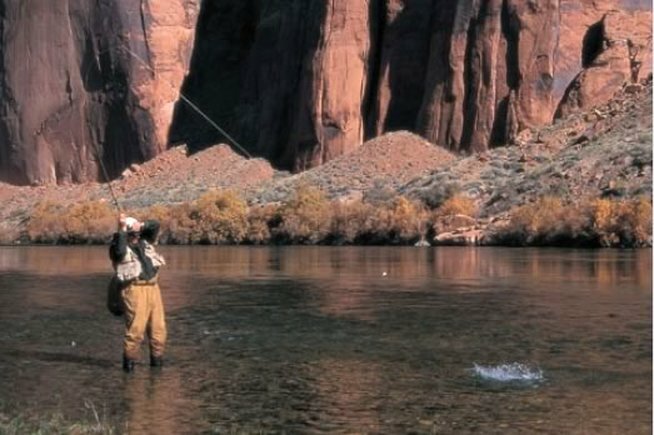 Back when I first began fishing the Green River in Utah, the 191/2 Scud was the ticket (a 50-50 mix of Ligas Dubbing #19 and #20) to catching large trout below the dam. Scuds turn a tan color when they molt, when the scud sheds its old shell and replaces it with a new, shinier shellback. Trout key on scuds when they are molting because they are soft and easy to eat. Other anglers, including Roger Hill, fish tan scud patterns to imitate trout eggs during the spawning periods. He has had tremendous success fishing tan scuds at the Spinney Mountain Ranch during February and June when the trout move up out of Elevenmile Reservoir to spawn. Orange scuds are important too. Tailwaters with substantial flow variations due to hydroelectric power generation leave scuds stranded along the streambed when the river drops. The scuds turn orange quickly after they die, and then get knocked loose when the flow rises again, creating a feeding frenzy. This occurs on most tailwaters where flow fluctuations occur. Trout also take orange scud patterns as egg imitations, and during the spawning periods, anglers frequently fish a scud as an attractor and drop a mayfly or midge behind it. Concentrate your efforts in the faster slots and seams behind the spawning areas where eggs are drifting downstream. While not as prevalent as scuds, sow bugs, sometimes referred to as cress bugs, are important in a few Western tailwater fisheries. As the name implies, you’ll find populations of sow bugs (cress bugs) in cooler spring creeks and tailwaters where watercress abounds. It’s not uncommon to see trout trying to dislodge sow bugs from the rooted vegetation, and capitalizing on this helpless food organism as it floats downstream. Sow bugs are extremely important on the Bighorn River in Montana below Yellowtail Dam. Sow bugs are typically gray, and have a flat, segmented body and seven pairs of legs that protrude sideways in relation to the abdomen. They are poor swimmers, and often drift long distances without movement if they get dislodged from the aquatic vegetation. Mysis relicta, commonly called opossum shrimp or simply Mysis, are a major food source for trout, steelhead, salmon, smelt, alewives, sculpins, and many other fish. They naturally inhabit many lakes in British Columbia, and are a critical part of the ecosystem. In 1949, biologists began stocking Mysis shrimp in other lakes and reservoirs. The Colorado Division of Wildlife introduced Mysis shrimp into Dillon, Taylor Park, and Ruedi Reservoirs in the early 1970s to feed the Kokanee salmon residing in the shallow coves and bays. At the time, the Colorado DOW had no idea how these shrimp would impact the trout below these dams. In one sense, the stocking of Mysis shrimp backfired (as far as a lake food source is concerned), because they feed on zooplankton, which is also a key food organism for small Kokanee and juvenile trout. Unfortunately, Mysis shrimp are light-sensitive and prefer water temperatures of 57 degrees or colder. They migrate daily, residing in the dark, deep areas during the day and swimming into shallow water at night. As it turns out, the Kokanee salmon’s behavior is exactly the opposite, eliminating the opportunity for them to partake in the Mysis shrimp feeding frenzy. On a positive note, fishing below the tailwaters where Mysis shrimp were introduced has never been the same, because a shrimp diet makes trout grow big! The section below Taylor Park Reservoir is called the Hog Trough because of the enormous trout that feast on the high-protein shrimp. Living Mysis shrimp are transparent, but they die and turn white shortly after they hit moving water. You’ll frequently see dead Mysis on weed-rich stream bottoms, but stomach samplings show that the fish key on the transparent version. One of the key identifying features is the dark, prominent pair of eyes. During certain times of the year (i.e., the lake turning over, and higher flows during spring runoff), massive numbers of Mysis shrimp flow from the base of the dam, causing tremendous trout growth rates, and often gluttony. Mysis-fed trout are extraordinary colorful—rainbows have brilliant stripes and gill plates, and browns have reddish-orange tails with dazzling red spots. Trout that key on Mysis shrimp can double their weight in one year, and often reach weights of 10 to 15 pounds or better. When large numbers of Mysis are released from the dam, nymphing is explosive. In fact, there are many times when you can fish two Mysis patterns at once. Because they are such a familiar food source throughout most of the year, a Mysis shrimp imitation is a great attractor in your two-fly nymphing rig. When there is a shortfall of Mysis shrimp spurting from the dam above, the large trout often key on tiny midges and mayflies to fill the void. Fishing with crustacean patterns requires no special tactics, because most of the time you’ll be bouncing them along the stream bottom. Scuds, sow bugs, and Mysis are most often fished as attractors in a two-fly nymphing rig. Many anglers do well fishing scud and sow bug imitations around thick weed beds, where fish are accustomed to feeding on them. Off the scud, most anglers drop a small mayfly or midge pupa. To fool trout rooting for sow bugs, remove your strike indicator (to help prevent spooking the trout) and time your casting with its feeding pattern as the trout drops back to feed on the sow bugs that are floating downstream. Get into a position where you can see the trout feeding; but maintain stealth, and make a series of quick, accurate casts. Set the hook when the trout is eating, shifting, rising, or flashing—all signs that it may have taken your fly.